Pastel-loving bloggers, eat your heart out. 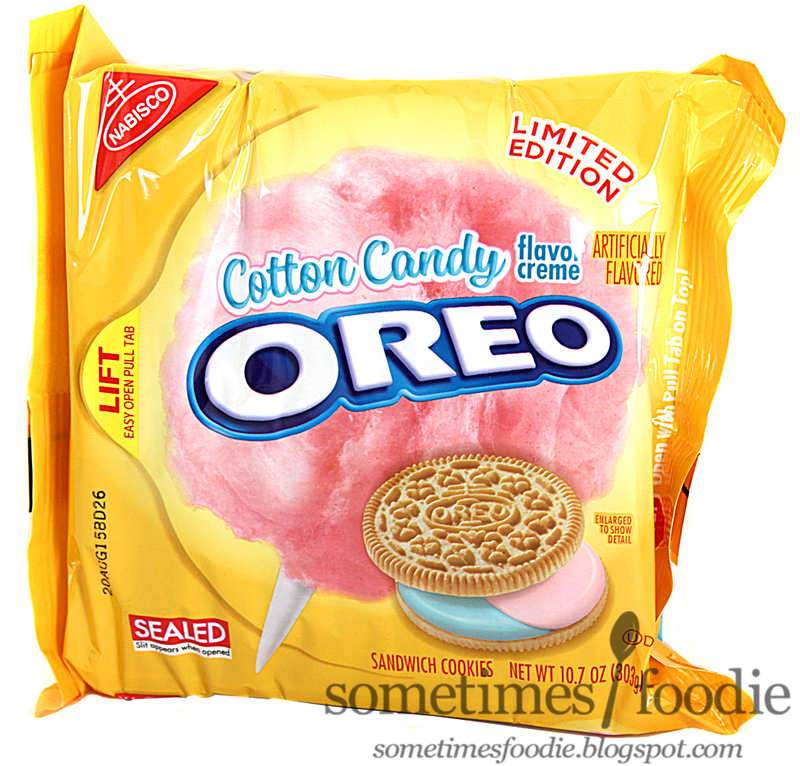 It's time for the official Cotton Candy Oreo write up! Let's get right into it. The packaging for this item is adorable, I love how the pastel colors look against the typical bright yellow of the golden Oreo packaging, but this has the same issue as all the other limited edition flavors. In a lot of super markets, where they stack products vertically, these special items get lost in the shuffle. If you didn't know there was a new Oreo available, you'd never even think to look twice at the cookie shelves to try and find this. As a crazy food blogger, we stalk these companies and their social medias accounts waiting for the chance to strike and pick up these fancy new items, but the typical consumer has no idea, and unless they follow food-related blogs, they might never even know this flavor existed. When I had these in the checkout lane people were interested and asked me about them and went to grab packages of their own. I really don't know why these companies don't change the coloring of the packages to make them stand out more. Part of me says leave it as-is because this camouflage allows me to snag items from the unsuspecting masses, but the designer in me says this is a total missed opportunity. Also, I'm sure every food blogger will mention this, but these limited flavor packages are getting smaller. 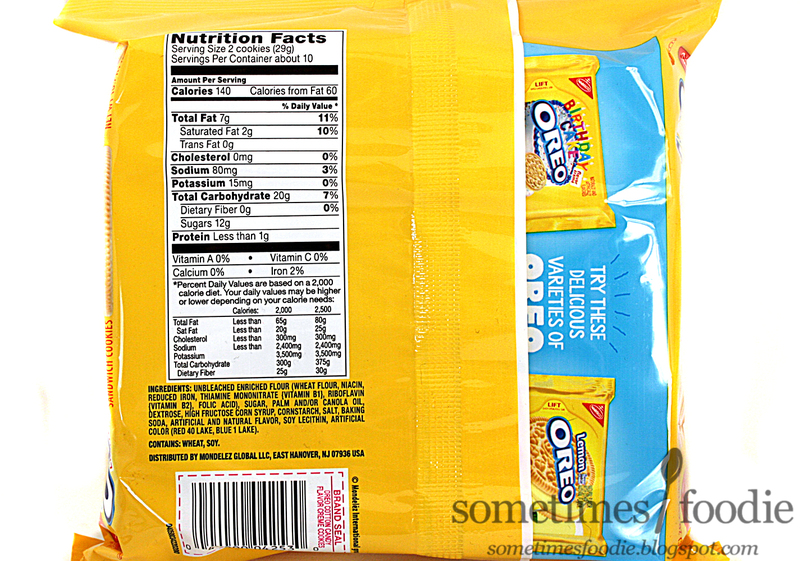 This package, and the current re-release of the Reese's Oreos, are significantly tinier than previously released flavors. With more risky flavors, like Fruit Punch, these tinier packages might have been appreciated (I still have a few of those sitting in a package in my cabinet), but with more interesting flavors like these, I would have liked to have more in my package. (Less cookies, sell same price. Profit.) Maybe these limited runs aren't as successful, and they aren't selling as well so to make up the cost differences packaging was downsized. Whatever the reason, I understand it from a business perspective, but as a cheap frugal consumer, I want more cookies for less money. The cookies inside smell sweet and vanilla-y, and from what I can tell the aroma is no different than typical golden Oreos. Maybe it's slightly sweeter, but it's barely noticeable, even under hot photo lights. Visually, the cookies are freaking precious. They look like little baby shower favors with their pastel pink and blue filling. These were a lot of fun to photograph, and I gotta say, just looking at them makes me want to paint my nails cotton candy colors. They are just too cute. If you're having a baby shower this month you should go grab these now for their aesthetics alone. I mean, these would be adorable topping a gender reveal cake! Custom cake makers, why aren't you scooping these babies up already? On it's own, this filling tastes just like cotton candy. I'm the kind of food blogger who is very hesitant to say things taste like other things, I am very picky about that, but this tastes just like the bagged stuff you buy on the boardwalk. The usual grainy sugar consistency of the Oreo filling works very nicely here, adding the grainy sugar texture to the spot-on cotton candy flavoring. Everyone I have given these to (5 people) remarks on how impressive the flavor accuracy is. I am very pleasantly surprised and impressed. These are way better than I expected, and I couldn't have been happier with the creme filling. 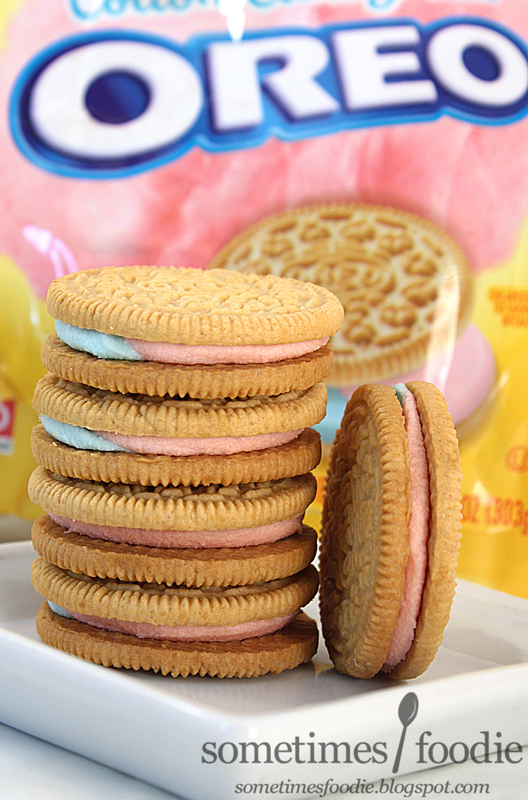 It's just the typical plain vanilla Oreo cookie. 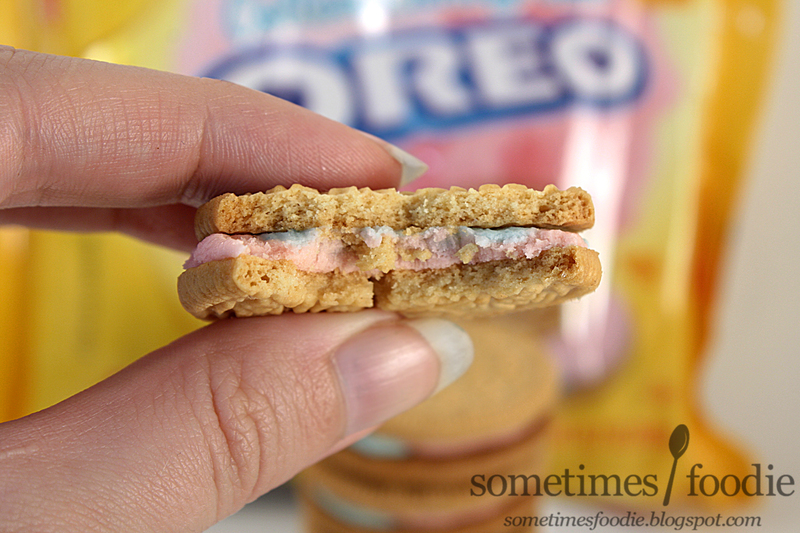 It's okay, but when you eat the cookie combined, as intended, the vanilla cookie mellows out the cotton candy flavoring and makes it a generic overly sweet vanilla with a cotton candy aftertaste. It's not bad by any means, but the creme filling really shines on it's own. 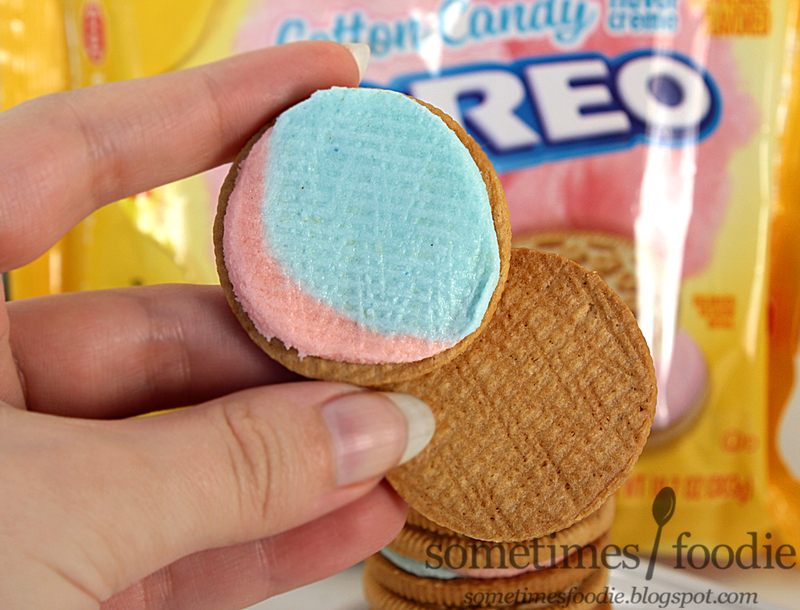 This is a cookie I highly recommend eating separately if you want the full impact of the cotton candy flavoring. Although the combination of the two is nowhere near as sweet as I thought it'd be. These aren't the little diabetes bombs that people thought they might be. As far as novelty products go, this isn't just a gimmick, it's a pretty impressive foodie-feat. This filling tastes just like cotton candy, it works, and I LOVE it. If you're into cotton candy and sweets, this is a must-try.